From Phil: Sleeping in the tent last night was tough. It was warm and humid from all the rain. Luckily bugs didn’t really get bad until we woke up and started packing up the van. I ate candy for breakfast and the girls made healthy hummus wraps for themselves. We headed out and it began raining again. Luckily it was just a light drizzling mist, with overcast skies. The national park continued to grace us with its tall green trees as we continued east. The rain died down and I stopped by a donut shop to grab the girls some treats for the road ahead. The most consistent thing about all the towns we have gone through in East Texas is that there is always some sort of breakfast donut spot. They all offered the same plain, chocolate and sprinkle options, and terrible drip coffee (fine for dipping donuts in). 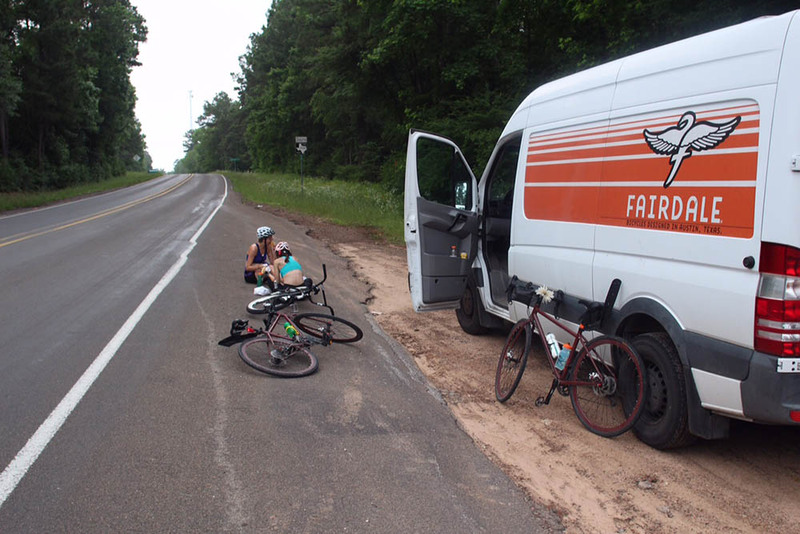 We stopped on the side of a quiet road and ate the sandwiches I picked up from the same donut place. After that, the girls rode another 30 miles. The rain progressively got worst as the miles went on. The rain got so bad I couldn’t even see out of the van and the girls got stranded at a gas station a few miles ahead. I got to the gas station and opened up the back of the van to let them in from the rain. Within the the first minute lighting struck one of the telephone poles only a hundred feet away. We also got a notification of a tornado warning on our phones. It was intense and the rain continued to pour. We all decided it wasn’t safe to continue and checked in to the closest motel just in the next town over. Even though we had to cut a few miles off of our day, we still accomplished a lot. We almost passed the 200 mile mark! Hopefully tomorrow will be sunnier. From Emily: I didn’t know what to expect waking up on the third day. I haven’t camped in a very long time and I haven’t gotten back on a bike after riding two long days back to back ever. We got up with the light and rain drops coming through our tents and started packing up. Our spirits were a little low and exhaustion was high but we motivated each other to hop back on our bikes and so began day 3. We kept an awesome pace for the first 2 hours. Especially after the first few miles, it became a lot easier, but that may have something to do with the all the hills going down through the forest :). Sam Houston National Forest was such a beautiful place, and gave us plenty of shade. I’m so fortunate to be on this adventure through Texas before I move out of the state this summer. Biking has given me such a wonderful opportunity to take in this beautiful state like I have never before! It has also helped immensely to have Phil and the support van around to drive ahead and get us snacks, ice and fresh water. By the time lunchtime came around we met Phil to refuel and that’s when trouble started. Almost immediately after we finished lunch and got back on our weekenders it started pouring rain. After going through rain the full first day we knew we could keep pushing on and hoped for the best. We got about 10 miles outside of Cleveland, TX on TX-105 and a lady pulled over to let us know there was a tornado warning in effect for the next hour. We pulled over to a gas station and called Phil and by the time he got there we couldn’t have been happier with the decision to stop. The storm was really picking up, we saw lightening hit an electrical pole and we made the decision to pack up the bikes and drive a hotel. We finished the day early, a little bummed but Mother Nature had different plans for us, and we wanted to be safe first and foremost.